Read about this Japanese island home here. What differentiates a house designed by architects from a woodland nest built by a robin or a rabbit? That basic, elemental question—and a desire to narrow the gap between the two— inspired the 1,300-square-foot home Hiroshima-based architect Keisuke Maeda designed for a teacher, her two teenage daughters, and their cat in the hills of Onomichi, on the southern end of the Japanese island of Honshu. “It’s a nest that’s dug into the ground and covered with fallen leaves, where inside and outside flow into each other. That seemed right for a house near the woods,“ says Maeda. 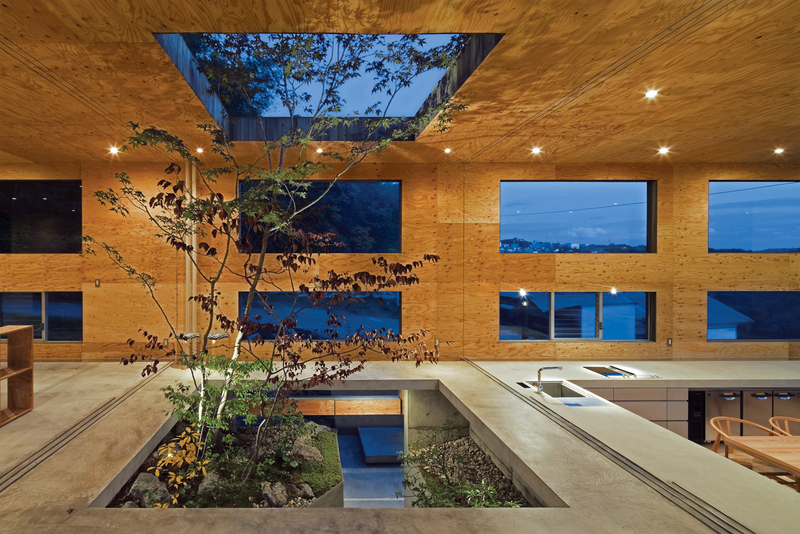 The building is composed of a partially buried concrete box covered with a well-insulated cedar-and-larch shell (what Maeda calls “the nest” and “the fallen leaves”). The open-plan living, dining, and kitchen area sits at one end of the long rectangle, with the bedrooms at the other. In between lies an enclosed courtyard through whose glassless windows rain, wind, and an occasional bird drift in. Sunlight, too, falls in dappled patches through the abundant windows and skylights, warming the concrete base in winter. The courtyard gives the three residents a sense of being close to one another—but not too close, says Maeda. “Sitting in the living room, you can look across and see the light in the bedroom and know someone is there,” he says. For now, a paper divider screens the girls’ bedroom; when they move out, their mother will take down the screen to create a cozy one-room nest that’s likely to feel anything but empty.